The Futbolgrad Network has taken a look at five players, who could have a major impact in the round of 32 of the UEFA Europa League. Giuliano, Bernard, Jonathan Cafú, Sardar Azmoun, and Cristian Ramírez are five players to watch in the next round of the UEFA Europa League. The round of 32 of the Europa League, and the round of 16 of the UEFA Champions League will kick off next week. As always, the Futbolgrad Network will keep a close eye on all the games involving teams from the post-Soviet Space and the Balkans. Sadly, it has been a disappointing group stage for teams from the post-Soviet space in the UEFA Champions League. While FC Rostov managed to finish third in their group, and therefore continue the European season in the Europa League, CSKA Moscow, and Dynamo Kyiv were eliminated in the group stage. Rostov will, therefore, join the likes of Zenit Saint Petersburg, Krasnodar, and Shakhtar Donetsk in what will be, according to Sports Betting Dime, an absorbing knockout stage in the Europa League for Futbolgrad readers. After bringing you a list of young talent from the Balkans and the post-Soviet space that you should keep an eye on in the round of 16 in the Champions League, we now bring you the five players you should look out for in the round of 32 in the Europa League. Giuliano has been one of the best players for Zenit Saint Petersburg, in the group stage of the UEFA Europa League. There could be even an argument made that the Brazilian is the player of the tournament thus far. The Brazilian attacking midfielder has scored six goals, and has given five assists in six Europa League matches this season. Signed from Grêmio in the summer transfer window, Giuliano was brought in to replace the Brazilian superstar Hulk. Originally a winger, Zenit head coach Mircea Lucescu moved Giuliano to the centre of the park where he plays almost like a false nine in a 4-3-3 or 4-2-3-1 formation. After a successful group stage in which they won five out of six games, Zenit is now considered one of the favourites to win the Europa League. 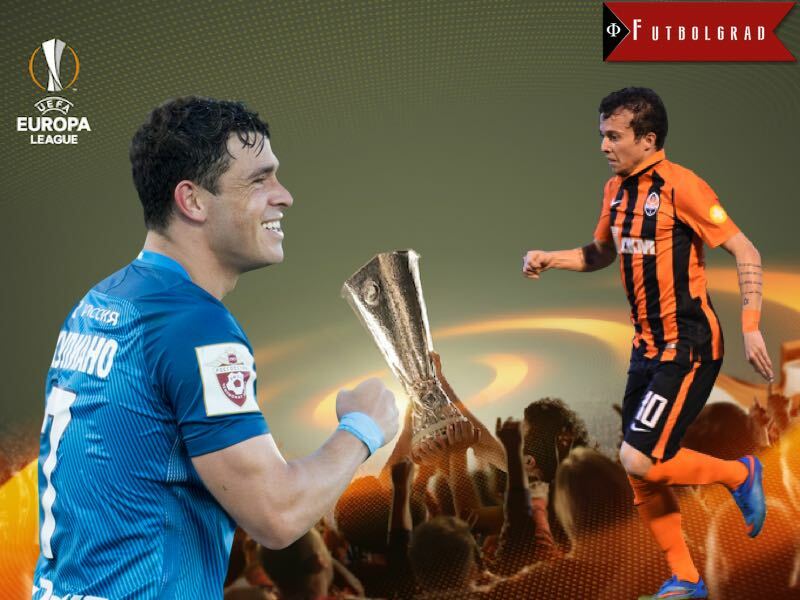 But for Zenit to have a chance of winning their second European title (they won the UEFA Cup in 2008) Giuliano will have to be in top form, and is certainly one of the five players to look out for in the round of 32 in the Europa League. Jonathan Cafú is one of nine Brazilians who play for Ludogorets Razgrad in Bulgaria. The 25-year-old forward has been a real revelation since joining Ludogorets from FC São Paulo in the summer of 2015. This season, Jonathan Cafú started the season with Ludogorets in the Champions League where he scored two goals in six matches. Jonathan Cafú, in fact, was a major factor in Ludogorets finishing the group stage of the Champions League in third place, which meant that the club qualified for the round of 32 of the UEFA Europa League. This is a major achievement for a small club from Bulgaria, and for Cafú (who also scored seven goals in 16 Parva Liga games in Bulgaria). Playing in the UEFA Europa League could be another opportunity for Jonathan Cafú to shine, and perhaps to secure a transfer to a major European league. It is sometimes difficult to remember that Bernard is still only 24. The Brazilian first joined Shakhtar Donetsk from Atlético Mineiro in the summer of 2013 for €25 million. Shakhtar hoped that the Brazilian playmaker could step in and replace Henrikh Mkhitaryan, who had left the club that summer to join Borussia Dortmund. But Bernard struggled with life in Ukraine. With the outbreak of the war in Ukraine, Bernard was one of the players involved in a player revolt in July 2014 that included several Brazilians whose goal was to have their contracts dissolved. Shakhtar owner Rinat Akhmetov, however, was adamant that the players had to honour their contracts. Bernard, however, struggled to fulfil his potential. Then, in the summer of 2016, long-standing head coach, Mircea Lucescu, left the club for Zenit Saint Petersburg. Paulo Fonseca, who replaced Lucescu, has managed to get the best out of Bernard. Under Fonseca, Shakhtar won all six group stage matches, and are perhaps one of the biggest favourites to win the competition. Sardar Azmoun made major headlines during the winter transfer window after he was heavily linked with a move to both Liverpool FC, and Borussia Dortmund. The Iranian forward was one of the standout players during Rostov’s Champions League group stage campaign. Azmoun scored Rostov’s goal against Atlético in Madrid, and then was inspirational in Rostov’s 3-2 victory over the German giants, Bayern München. A quick and intelligent player, Azmoun will now be one of the key players in Rostov’s remaining Europa League campaign. The Russians are drawn against Sparta Prague in the round of 32 and, with Rostov’s Champions League campaign in mind, the Russians will be favourites against the Czechs next Thursday. The big clubs from Western Europe will certainly be watching whether Azmoun can confirm his performances against Bayern and Atlético, and whether he warrants a big money move to a club in one of Europe’s top four leagues. The prolific Fedor Smolov is, of course, the key player for Krasnodar in the round of 32 of the Europa League. But, after having covered his career in great detail, we want to bring the attention to Krasnodar’s new signing, Cristian Ramírez. The 22-year-old Ecuadorian left-back joined Krasnodar from the Hungarian side, Ferencváros. The Budapest-based club has experienced a real renaissance since the German head coach, Thomas Doll, took over the club in December 2013. Ramírez, who is a product of the Ecuadorian club, Independiente del Valle, first moved from South America to Europe after joining the German side, Fortuna Düsseldorf, in 2013. But Ramírez failed to make a lasting impression with Fortuna, and later Nürnberg, where he spent half a season on loan. Frustrated, Ramírez joined Thomas Doll at Ferencváros. In Hungary, Ramírez won the national championship in 2016, and became a standout player for the Fradi. After having won everything there is to win, Ramírez seemed poised to take the next step. With Krasnodar looking to go younger, the Russian club appeared to be the perfect next destination for the Ecuadorian who certainly has the talent to succeed in a big European league, and is therefore one of the five players to look out for in the round of 32 of the Europa League.